Home ANGELI DIONE GOMEZ BEA ROSE SANTIAGO BEAUTIES MEGAN YOUNG MISS INTERNATIONAL MISS SUPRANATIONAL MISS TOURISM INTERNATIONAL MISS WORLD MUTYA DATUL PAGEANTS RIZZINI ALEXIS GOMEZ Miss Tourism International 2013 winner is Angeli Dione Gomez, a back-to-back win for the Philippines! Miss Tourism International 2013 winner is Angeli Dione Gomez, a back-to-back win for the Philippines! 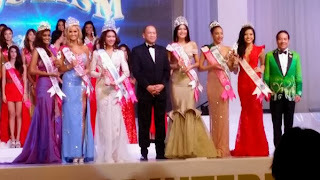 Miss Tourism International 2013 -2014 winner has been crowned! And it's Philippines again thru Angeli Dione Gomez, the 3rd Pinay to win the title. Just when you thought it's already over for the Philippines winning a beauty pageant title in 2013, it just did. And you're even more wrong if you doubted the country can score a rare back-to-back win in a pageant. Last night, December 31, 2013, as the world was preparing to embrace a brand new year, Miss Tourism International 2013-14 was being held at the Marriott Hotel Putrajaya in Malaysia with 60 candidates competing for the title. And at the end of the pageant, crowned Miss Tourism International 2013 winner was Miss Philippines Angeli Dione Gomez, 20, succeeding last year's winner Rizzini Alexis Gomez. Both Gomez. And both are from the Philippines. It's only the 2nd time in Miss Tourism International that a country won 2 years in a row. Poland already did it in 1998 and 1999. And that back-to-back win by the Philippines has just made the country as the most successful in Miss Tourism International, now having 3 winners. Philippines won the title for the first time in the year 2000 thru Maria Esperanza Manzano. Angeli Dione Gomez completed the Philippines' already impressive 2013 when it comes to beauty pageants. Previously, in the last 4 months, the country won Miss Supranational 2013 (Mutya Datul), Miss World 2013 (Megan Young) and Miss International 2013 (Bea Rose Santiago). Cnu sabi no1 ang gbbt, weeh d nga, call mmda prove it.